The Waning Crescent Moon invites us to take a deep dive into our Being and observe aspects of ourselves that were previously hidden by the bright light of the Full Moon. The Waning Crescent Moon is connected with the fourth and last phase of our menstrual cycle. However, that does not mean you should necessarily menstruate during the New Moon or ovulate during the Full Moon. Instead, it represents the type of energy we are actually working on during this specific phase of the menstrual cycle. When we have our moon (during our menstruation), our Being is overwhelmed with feelings of seclusion, contemplation, and quietness, in addition to hopeful dreams, and strong intuitive and visionary powers. Just like the energy of winter. During the second phase of the cycle, when we stop bleeding, we incorporate the archetype of the girl, the young woman, the virgin, the princess, together with aspects, such as spontaneity, responsiveness, willingness, and vitality, in addition to full attention, focus, willpower and action towards our personal projects, ambitions, and objectives. Just like the energy of spring. During the third phase of the cycle, that is, during ovulation, we are full, filled with light, enthusiastic, and communicative. Our sexuality becomes increasingly more evident in our creative activities, in our capacity to connect and integrate with other people, in the way we dress and interact: in a sympathetic, protective, nourishing, and hospitable manner. Just like the energy of summer. As we approach the last phase of the cycle, our light begins to dim naturally. That is when you should use all the creative power and urgency this phase offers to finish whatever you have initiated in this cycle, letting go of everything you do not need to take with you into the next cycle. During this phase, we observe a process of transition towards our shadows, the deepest and most obscure parts of our Being. Connected with the energy of autumn, that is when the leaves dry and fall, the flowers die, the days become shorter, and the nights are longer. It is a feeling of death, seclusion, retreat, darkening. Known as PMS, this period is seen quite negatively and incorrectly by he people in general. The aversion to this period reflects the tendency towards denial and escape our society reveals when we talk about death as a process of detachment and surrender. It reflects our difficulty in letting go, in allowing to break, to undo, and to disappear to be reborn with a new sense of existence in the new spring. This aversion reflects the tendency towards the denial of our shadows: our pains, limitations, emotional wounds, pain-body, limiting standards and beliefs, fears, negative involuntary actions, and internal conflicts. We live in a society that overestimates whatever is beautiful, bright, young, and efficient... Whatever is external, and grows, expands, glows, and impresses... While denying growing old, reducing, withdrawing, internalizing, and feeling sad as a process of growth, transformation, and increased awareness. Our shadows, and how we deal with them, have been the object of study of many masters and professors of several spiritual philosophies as the key, the way to achieve true awakening. Knowing and dancing through this dynamic balance of our menstrual cycle is, definitely, an opportunity to grow, strengthen the spirit, mature the soul, and awaken every aspect of the woman you are. However, this journey requires that each of us honor the constant impermanence and transformation that takes place cyclically within us, in addition to welcoming each phase of the cycle unconditionally. By believing that some part of us is inadequate, we slowly create barriers in our minds that prevent us from noticing that we are denying our true Being. Consequently, we continue to build our lives while sweeping all that under the carpet and allowing it to control our actions and reactions, influence our choices, suggest personal behaviors, and guide our destinies, making us slaves of the reality we created. The PMS allows us to see who we truly are, what we really want to manifest, and how we really want to live the journey of life. That is the only way to become the creators of our own reality and continue towards our greater destiny of fulfilling our Being while feeling whole, confident, and awaken. Our shadows are aspects of our Being that we would rather not face, because we fear not being loved, accepted or appreciated; we fear feeling inadequate; we fear losing control or the sense of security. By getting in touch with our shadows, we can see clearly what needs to be changed, what needs to be left behind, and what needs to be healed, in addition to the masks and loads, ideas and beliefs that need to be left behind to allow us to move towards the new cycle more truthfully, lightly, fully, and authentically. During the PMS and the meeting with our shadows, there is a great difference between “legitimating an unconscious reaction” versus “making positive changes to our lives after becoming aware of oneself”. Acting on impulse, and justifying aggressive, violent actions, drama, and self-victimization because of PMS is completely different from effecting a process of cure. To do so, it is very important to keep focused and present, to observe yourself and keep from judging. Remain who you are, embrace the information that surfaces, whatever they are. Make a commitment to let go, together with your menstrual blood, everything that you do not need any more and has caused you so much discomfort and irritability at the end of your cycle. Remember, certainly and consciously, that everything that happens outside is the result of your own internal processes and, likewise, transformation ALWAYS takes place from the inside out, ALWAYS from the principle of self-accountability. During this process, it is very important to respect and be nice to yourself, to allow yourself time and space and slowly prepare to leave the world, making a commitment to your own mind, body, and spirit to retreat, to embrace the silence and the quietness and to rest. During your PMS, once you commit yourself to withdrawing from the world for a moment when you have your moon (your menstruation), all this process becomes much milder. Empowering yourself as a woman and reconnecting with the Sacred Feminine within all of us is part of legitimating our Woman Being as a whole: our menstrual blood, our cycle, our shadows, and, yes, our PMS, that is, getting to know ourselves based on the dynamic balance of our cycle. What a great opportunity and tool our bodies offer us to awaken and fulfil our Being! Listen to the call of the Waning Crescent Moon that announces the return to the dark caves of the soul. Choose what you want to take with you during this period of retreat and what you want to leave behind. Choose, then, what truly nourishes you, so that you can lie down fearlessly on the lap of the New Moon and allow it to cover you with the cloak of darkness until the Waning Crescent Moon returns, until the return of a new spring, when you can start again, from the same place, as if it were the first time. **Text by Morena Cardoso: woman, mother, body therapist, traveler, searcher, writer, visionary of the Moon Mandala, creator and facilitator at DanzaMedicina. 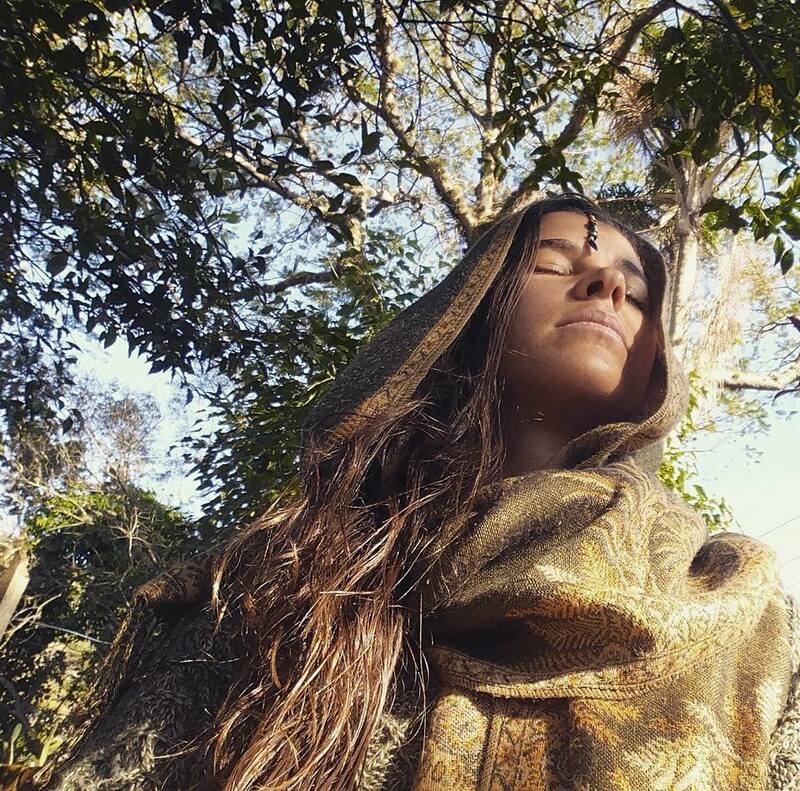 For over a decade, Morena has traveled to sacred places around the world and met different cultures and ancient traditions, acquiring ancient knowledge about the Sacred Feminine and healing tools based on the psychotherapy of body and movement, which today she shares with hundreds of women through workshops and retreats.